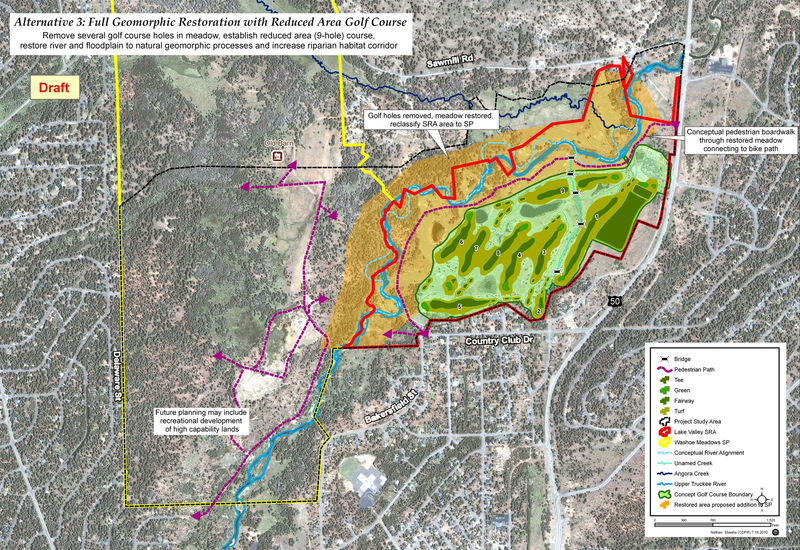 Alternative 3: River Ecosystem Restoration with Reduced-Play Golf Course Same river restoration and area of golf course removal and meadow/floodplain restoration as in alternative 2, but no golf course holes would be relocated to the west side of the river. The smaller golf course would be reconfigured as a 9-hole or an 18-hole executive style course. All bridges would removed, a boardwalk would be constructed on the east side of the river same as in alternative 2. No changes to the roads and trails on the west side of the river would occur. This alternative would include the same river and floodplain treatment as Alternative 2,,but the reconfiguring would result in a reduced golf area (9-hole or executive) on the east side of the river. All golf course bridges would be eliminated. No exchange of land between the 2 state park units would be needed.